The Parakeets have moved their nests from the trees to the shoe racks. ‘Shoe racks?’ you might ask. Yes you’ve read it right, shoe racks. 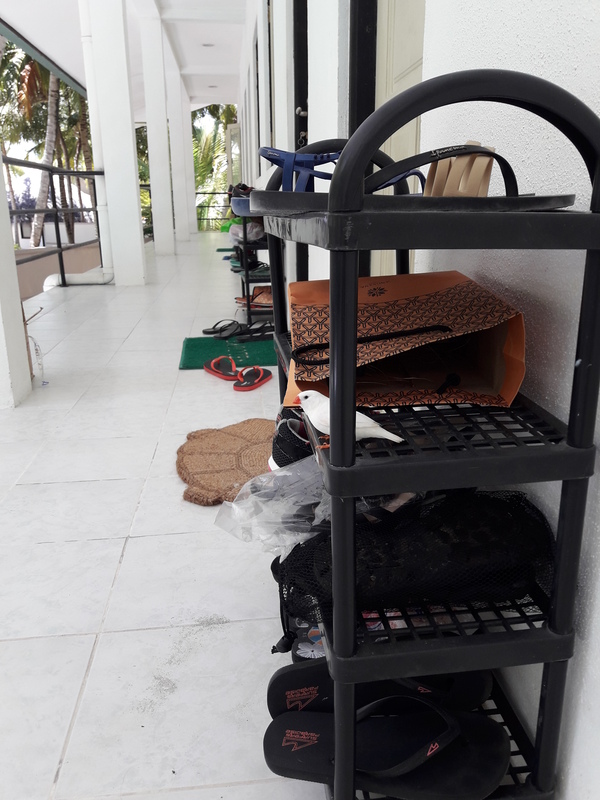 Outside our rooms stand several shoe racks in a row and it was one afternoon when we noticed a thick nest in Pook’s shoe rack. The second row of her shoe rack became a cradle for a small Parakeet family. It became everyone’s joke, that nest in that shoe rack, until the Parakeets started taking their migration seriously. A few days after the discovery of the nest in Pook’s shoe rack appeared another nest but this time not in a shoe rack but rather, in a shoe itself. 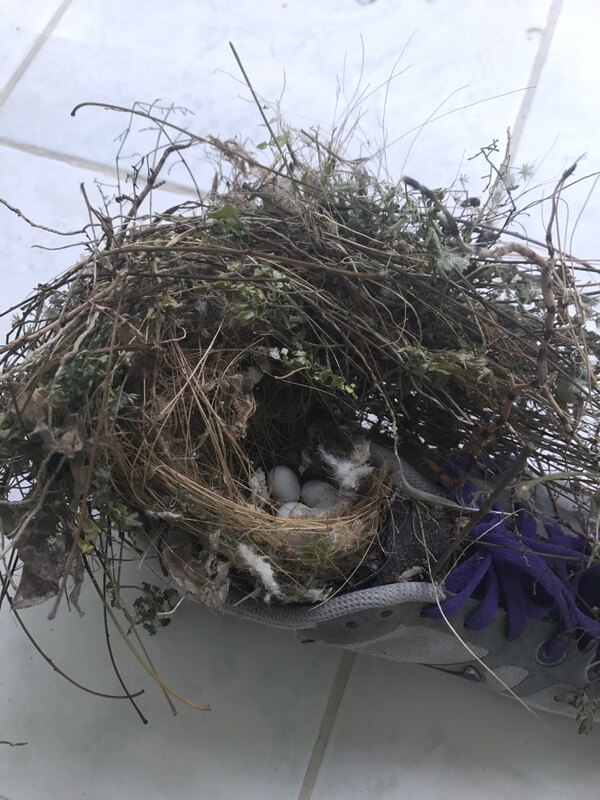 Kai’s left running shoes became nest to a white Parakeet couple and their eggs. See, these Parakeets vary in colours. We saw white ones in Kai’s shoes but unfortunately we didn’t see the Parakeets that nested in Pook’s shoes. It could be the white ones too, but it could also be the green or the yellow ones. Nonetheless, these Parakeets sparked the excitement and worries in us. Each morning as we leave our rooms, we scout for new nests. Not finding one disappoints us. Finding one on someone else’s shoe rack is fun but finding one on our very own shoe rack troubles us. I am guilty of destroying a soon-to-be territory of these colonizers on my very own shoe rack. One morning, I saw two white Parakeets flying their way on my shoe rack, each one carrying a twig on their beaks. They left the twigs on my shoe rack then flew away. I waited. After a few minutes there they were again with twigs. I didn’t know if I’m gonna let these tiny colonizers mark their territory on my shoe rack or if I should destroy their base camp even before they complete it. And as I didn’t like the thought of having free tenants, I did the latter. I decided to ruthlessly remove their twigs on my shoe rack right then and there. After a month or so, the eggs in Kai’s shoes hatched and there lied tiny bird-lings sitting next to each other. We checked them every once in a while to see how they were growing till yesterday when we only saw the remnants of the nest. The shoe disappeared and no one knows where the bird-lings are now. The mother and father Parakeet kept coming back to where the shoe-nest used to be, only to find nothing. I felt bad just imagining how the couple feels. That the weather kept changing, the Parakeets also do. And until when this migration madness will be, only the Parakeets know. As to where the bird-lings are, no one knows. As to who the real invaders in this true to life story is, it’s up to you to tell. Nakakabahala yan na instead sa puno, eh sa shoe rack na sila nagtatayo ng mga nest nila. Gawa na rin siguro ng climate change. Mismong sapatos ni Kai kinuha din? Aw kawawa naman! Sana makahanap sila ng safe nesting place not in the shoes. Meron din dito sa balcony namin, nilagyan nalang ng asawa ko ng carton at talagang dumadami sila ang cute ng mga sisiw, hindi nga lang parakeets mga kalapati. Nakakaawa kasi. Naiyak akoooo sa part na “they keep coming back” 😳 ineexpect nila na makikita nila ulit ung birdlings pero wala na. Ang sakit 💔 sana magkita kita padin sila. That means nature is trying is to claim human’s stuff for themselves. I love that it’s birds that are doing that. …. and not snakes. You better buy a book about parakeets.